The sequel to 2010's sci-fi hit is coming to UK Digital HD in December, with a DVD/blu-ray release in January. Back in 2010, the relatively low budget scifi thriller Skyline proved a surprise hit. Fans have been eagerly awaiting a sequel ever since, and the wait is almost over, with Beyond Skyline arriving next month. Along with the above artwork, you can check out the UK trailer and a clip below. The sequel sees Liam O'Donnell, co-writer of the original, take over directing duties, with a cast that includes Frank Grillo, Bojana Novakovic and Iko Uwais. 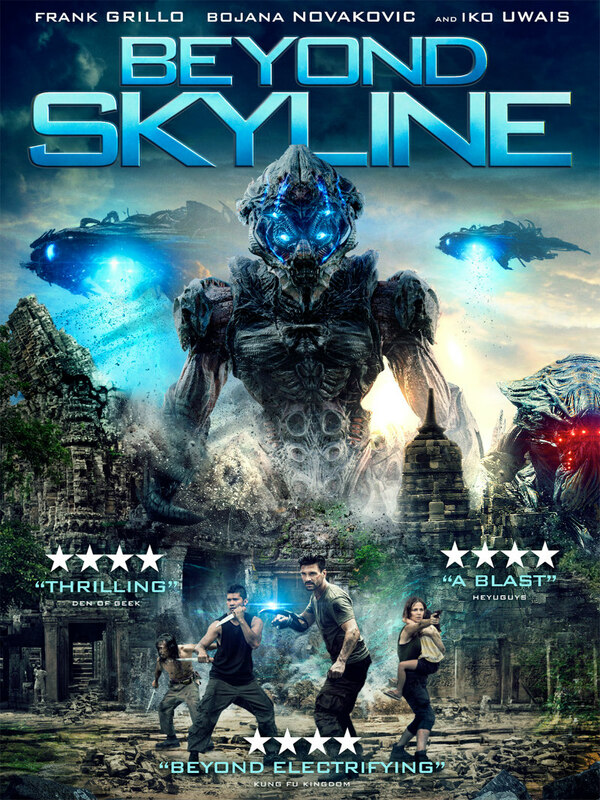 Beyond Skyline is available on Digital HD 15th December and DVD & Blu-ray 8th January. You can pre-order at Amazon. Los Angeles Detective Mark Corley (Frank Grillo, Captain America: The Winter Soldier) thought bailing out his eighteen-year-old son, Trent (Jonny Weston, Taken 3), was the worst part of his day. But on the ride home, the skies above fill with a strange blue light. Within moments, the entire city's population is vacuumed up into a massive alien ship. In the aftermath, father and son lead a band of survivors to the marina. But when Trent is abducted, Mark relentlessly storms after his son onto the nightmarish warship. As the aliens move across the planet, feeding off the remnants of humanity, the resilient Mark battles through the bizarre environment, uncovering their horrific secrets. Before long, he forges an alliance with an unlikely ally. Together they are able to crash the ship and rescue several abductees. Landing in Southeast Asia, they encounter a highly skilled resistance force, led by the deadly Sua (Iko Uwais, The Raid 1 & 2). In a race against time, these warriors from different sides of the world must unite to save their families and take back the planet.